In Sunday night&apos;s tilt between the Atlanta Falcons and the Green Bay Packers, one thing was clear from the get go: the Packers were losing the ground game. First they watched the Falcons use rushes of 15, 11, and 17 yards to advance into Packers&apos; territory en route to an opening touchdown. Then, Michael Turner punched in the Falcons&apos; second touchdown to give them a 14-0 lead early in the second quarter. Meanwhile, the Packers struggled to get the running game going, picking up only four successful rushes on 10 attempts in the first half. 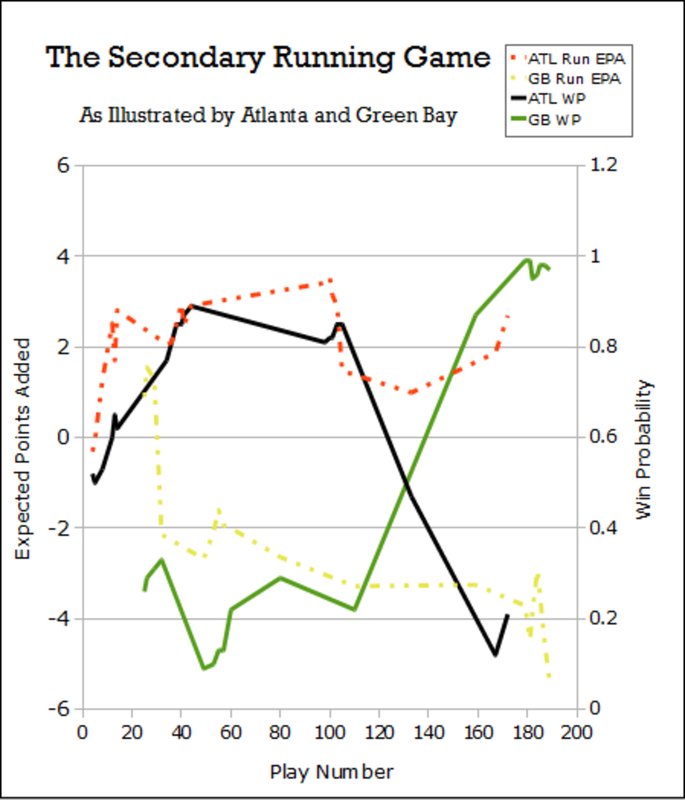 The Packers would end up with only 58 rushing yards, succeeding on only 37% of rushes (7-for-19). The Falcons, somewhat inexplicably, only rushed 18 times, but they succeeded on a 63% of them (12/19) in picking up 86 yards. But this is 2011, and the NFL is a quarterback&apos;s league. We need look no further than this game to illustrate this fact. Although the Falcons used the run effectively to gain their early 14-0 lead, Matt Ryan was money under center as well. Ryan was 8-for-10 with 80 yards and a score on these first two drives, picking up a striking 9.4 expected points added. 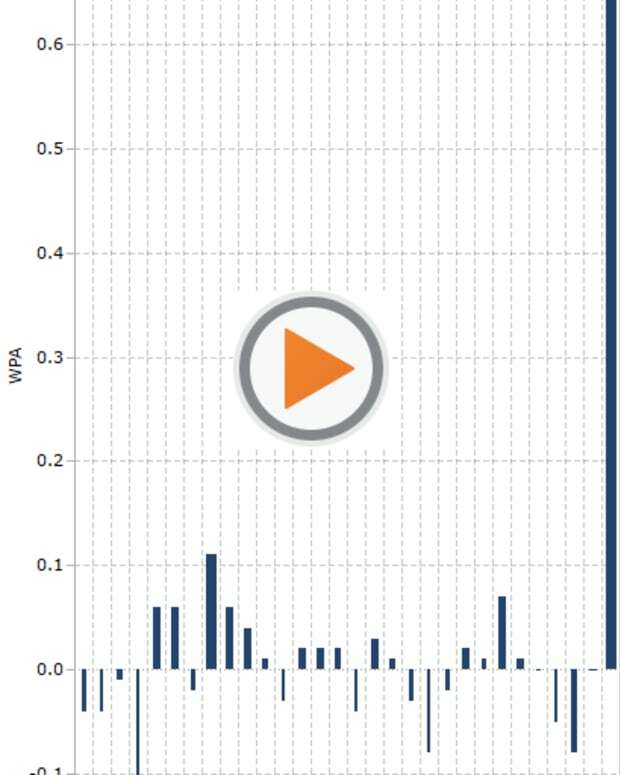 Meanwhile, Rodgers started relatively slow -- despite going 7-10 with 78 passing yards, Rodgers also took two sacks for -12 yards and earned a relatively meek 3.1 EPA. And things turned, slowly but surely. 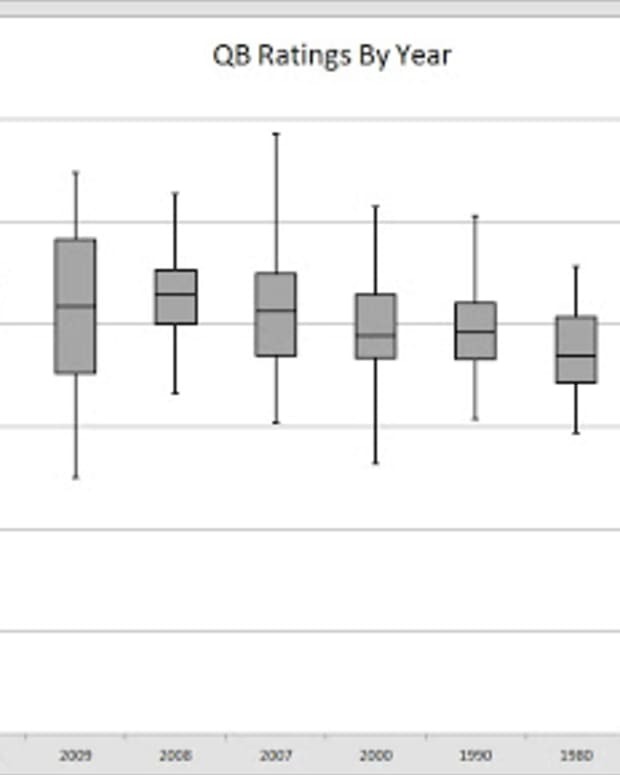 After each team&apos;s first two drives -- roughly the 50 play mark -- we saw a complete reversal of fortunes. Ryan utterly collapsed, completing only eight of his final 22 passes for 87 yards and two interceptions, a negative adjusted yards per attempt. As a 14 point lead slipped away, Ryan contributed -10 expected points added, and the Packers went on to produce 25 unanswered points behind the golden arm of Rodgers. Rodgers finished 19-for-29, picking up 307 yards and two touchdown passes, with the only blemishes two more sacks for -15 yards. 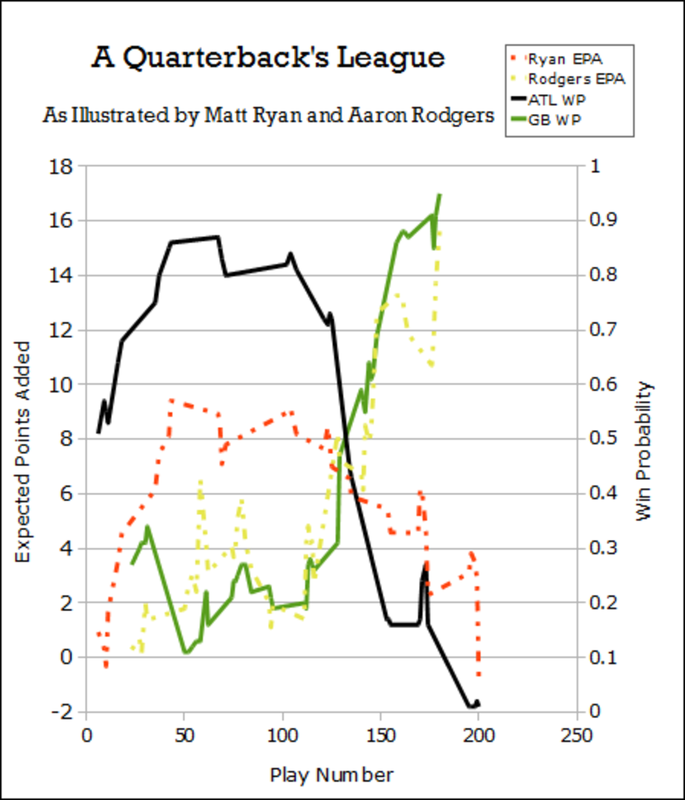 In the latter portion of the game, Rodgers averaged an excellent 9.4 adjusted yards per attempt and compiling another 12.5 expected points added, ending with a total of 15.8 in an 11-point contest. Let us not forget -- in 2010, the initial selections for the Pro Bowl were Michael Vick, Drew Brees, and Matt Ryan, with Aaron Rodgers nowhere to be found. Any controversy over Rodgers&apos;s snub was eventually moot, as his Packers reached the Super Bowl and he was ineligible to compete in the exhibition. 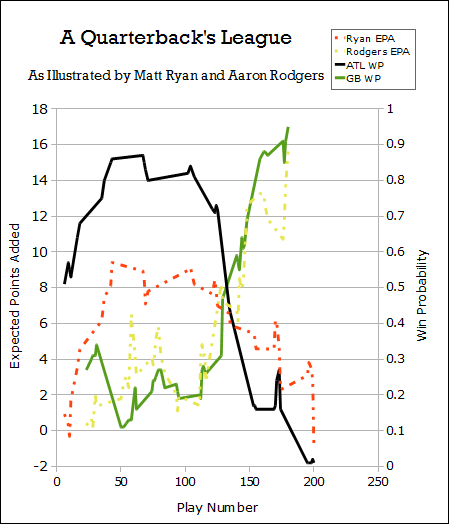 But it still allows me to make a point -- Rodgers has compiled 214.5 expected points added in the 2010 and 2011 regular seasons, whereas Ryan has 125.3. There isn&apos;t much of a comparison, and the better quarterback&apos;s team won again Sunday Night. NFL Analysis: Tim Tebow is a Pro Bowl Quarterback?